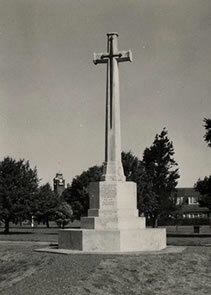 On Tuesday, 27 June 1922, with the Duke of Connaught, President of the Board of Commissioners in attendance, a memorial to the death of Old Boys in World War One was dedicated and unveiled at a cenotaph at the Deal Gate. What follows is a report of the event published in The Dover Express and East Kent News on Friday, So June 1922. The report is published in full for the reason that Bishop Taylor-Smith’s sermon speaks volumes that one may only appreciate with a full reading . As an enlisted soldier of World War Two and dedicated historian of this history site, I shall exercise the liberty of making editorial comment. That is to say, even allowing for the social, patriarchal and parochial tenor of the times, Bishop Taylor-Smith’s sermon strikes one as exceedingly patronizing and condescending. Offering sycophantic adoration of the Almighty, Taylor-Smith invokes God the Father, God the Son and God the Holy Ghost for granting victory, leaving no doubt in the minds of his listeners that victory was justly earned. Accepting the exhausting effort that won victory - munitions, guns, aeroplanes, ships, supplies and all the paraphernalia of war - not to mention the entry of the United States of America into the conflict, one has to wonder what grace of God was left over to acknowledge the deaths of a noble enemy and the bereavement of their loved ones. UNVEILED BY THE DUKE OF CONNAUGHT. On Tuesday the Duke of Connaught, the President of the Duke of York’s Royal Military School unveiled the War Memorial cross at the School and inspected the boys. The Duke of Connaught, who arrived at Dover by the 12.45 Boat Train, was accompanied by General Sir N.G. Lyttleton, Lieut-General Sir. H.E. Belfield, Lieut-General Sir Francis Lloyd, who are Commissioners of the School, Major-General Rover, Colonel Gordon and Mr. G.B. Crossland. The Duke’s car, which carried a Union Jack, drove through Dover and up Castle Hill. Awaiting His Royal Highness’s arrival, the officers, warrant officers, the students, who were in khaki, with rifles, and the boys, under Major Thomas, were drawn up on the parade ground, and His Royal Highness was received with the Royal Salute. The Duke of Connaught made a closer and lengthy inspect of the ranks, talking to the officers and men and boys, the latter of whom wore the badge of their father’s regiment. At the conclusion of the inspection, some 100 of the Old Boys, who were drawn up in the enclosure, were inspected by the Duke. The students and the boys then marched past the Duke, in open company columns, and afterwards in close company columns; and it need not be said that the march past was a perfect example of such ceremonial. The march over, the boys formed into columns for fours and headed by the band and bugles marched to the Chapel, where the Memorial Tablets with the names of the 247 Old Boys of the School, who fell in the Great War, were to be dedicated by the Chaplain General Bishop Taylor-Smith. These names are engraved on alabaster tablets of beautiful design, which are placed on the walls of the Chapel. The first tablet contains the names of those who fell in the War again Napoleon, and comprises those who fell in the Peninsular and at Waterloo. Following are the names of those lost in the wars since, but none contain such a list as that of the late war. It commences on one tablet that is only partly filled and takes two more completely and partly fills another. The body of the Church was crowded with the Boys, their bright red uniforms making a striking feature in this beautiful building of red brick, with white stone mouldings. After the Boys had entered, their colours were brought to the chancel and during the service, were fixed to either side of the chancel rails. The Duke of Connaught and his staff were seated on the cross-bench on the south side of the Chapel. The Old Boys and relatives of those fallen filled almost all the remaining space. The service opened with the hymn “How bright those Glorious Spirits shine,” sung with spirit by the boys. Major Dryer read the Lesson from Ecclesiastics xliv., verses 1-14. The two prayers The Lord’s Prayer and the prayer, Almighty God with Whom the spirits of them who departed hence.” were read by the School Chaplain, the Rev. R.G. Semple. The hymn, “For all the Saints,” was sung, and then “God save the King,” and the Benediction concluded the service. 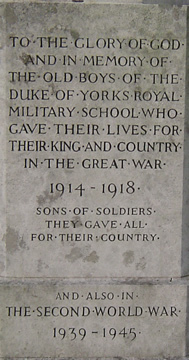 “To the Glory of God and in Memory of the Old Boys of the Duke of York’s Royal Military School, who gave their lives for King and Country in the Great War, 1914-18. The Duke afterwards inspect the School, the rain storm having blown over, first witnessing a very clever gymnastic performance by the gymnastic class under S.N. Instructor Wragg. As the Duke took his place to witness the performance, he was introduced to the Mayor of Dover. Speaking to the Mayor, he said that he always had very pleasant recollections of Dover, with which he was associated in his early years; he enquired if there was any serious unemployment in the town, and if the ex-Service men were suffering, and expressed the hope that all that was possible would be done for them. He also referred to the unveiling of the Dover Patrol Memorial at Cape Blane Nez, which is to take place on July 16th at which his son-in-law (Captain the Hon. A. Ramsay) would be present. The performance was one that showed the boys at their best. Despite the high wind, they were simply magnificent, and the Duke, as well as all present, repeatedly applauded them. At the close of the display the Duke went to Sergt.-Major Instructor Wragg and personally congratulated him. After tea the Duke of Connaught returned to Dover en route for London, and as he left the School he was heartily cheered by the boys. The Old Boys present included the following: Major Lickman, Captain Burrows, Lieut. Burrows, Captain Stanton, Flying Officer Gardner, Captain Cathcart, R.Q.M.S. Booker, S.M. Horton, Mr. Markham, Sergt. Matthews, Sergt. Dudley, Q.M.S. Vokins, Mr. T. E. Palethorp, D.C.M., Mr. Tofree, Mr. Huggins, Mr. Sampson, Mr. Bird-Howard, Q.M.S. Atkins, Mr. Lunam, Mr. Bowden, Q.M.S. Heaysman, Corpl. Culver, Corpl. Case, Bandmaster Dodoughan, Sergt. Earle, Sergt. Gillett, W.O.1. McCarthy, W.O.1. Smith, Bdr. Connolly, Bandmaster McDonald, Bandmaster Cole, W.O. Lee, W.O. Waterson, W.W. Smales, W.O. Meehan, Mr. Thomson, Mr. A. Brent, Mr Lurham, Lieut. Elmalie, W.O. Rove, Mr. Dartnell, Mr. J. Hunt, Sergt. Harle, Mr. Flynn, Mr. Dimond, Mr. McDonald, M.C., Mr. F. Dicken, Mr. Lewis Rudd, Bandsmen Burns, Stevens, Fisher, Bill, Harden, Coble, Boys Poole, Halford, Hills, Woodford, Ford, Coppin, Russell, Murray, Hillook, Edgar, Hubert Tatio, Evans, Hayter, Gilbert and Plunkett.